The Trump campaign announced over the weekend that they had set a campaign record for fundraising in September. According to a statement on DonaldJTrump.com, the campaign took in $100 million dollars last month. According to the statement, the Trump campaign fundraising has received more than $360 million dollars from 2.6 million people since it began. USA Today reports that the Republican National Committee raised an additional $39 million. Like Trump’s claim that he got more votes than any other candidate in any Republican primary, there is both good and bad news associated with the fundraising claim. While impressive, the $100 million take is alarming when taken in the full context of the campaign. The most obvious problem is that the figure includes a monthly contribution of $2 million by Mr. Trump himself. Trump’s contribution “more than covered the costs of any reimbursements to him (or his related entities) for his plane and office rent; which the law mandates to be reimbursed,” the statement said. Even more alarming is the fact that Trump’s fundraising lags behind Hillary Clinton as well as that of Mitt Romney four years ago. Politico reports that the Clinton campaign raised more than $154 million during September. This includes $84 million by Hillary for America and $70 million by the Democratic National Committee. Unlike Clinton, who can count on assistance from the DNC, the Trump campaign may be on its own. After the release of the “Access Hollywood” tape, Politico obtained an email from the Republican National Committee stopping production on Trump campaign materials paid for by the GOP “Victory” fund. 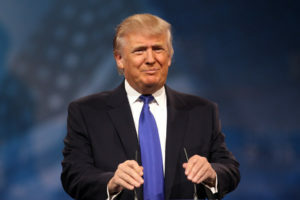 It is uncertain at this point whether the RNC is financially supporting the Trump campaign or for how long the campaign can count on its support as Trump falls in the polls. Trump and Clinton both lag far behind Mitt Romney’s fundraising from 2012. The L.A. Times reported four years ago that Romney had raised $170 million, which was short of the $181 million raised by Obama. At this point in the campaign, Romney had raised $839 million, more than double the receipts of the Trump campaign. The $100 million figure may also be offset by refunds. Fortune reports that some GOP donors are asking for their money back in the wake of the sexual assault scandal. It is unknown whether the Trump campaign will return any funds, but donor displeasure with Trump will almost certainly impact his fundraising going forward. That small donor success has come at the cost of losing larger donors though. Many traditional GOP fundraisers have not supported the nontraditional nominee. Some donors, such as megadonor Sheldon Adelson, are focusing on support for congressional races rather than contributing to the RNC or Trump campaigns, said USA Today. Much of the Clinton advantage in fundraising comes from her Wall Street connections and other wealthy donors. Fortune found that Clinton is outraising Trump among billionaires by 20 to one. In fact, another Fortune article reports that no Fortune 500 CEOs are supporting Donald Trump, even though almost a third of them supported Mitt Romney. It is surprising that a candidate who based his campaign on his business acumen doesn’t garner support from his fellow business leaders. In spite of a good month in September, Trump’s fundraising may well have reached its peak. Trump’s populist rhetoric and bombastic personality have hurt his ability to raise funds throughout the campaign. Now, it is likely that scandals will be a financial drag for the last few weeks before the election. The fundraising deficit will make it difficult for Trump to overcome negative attacks and reverse his decline in the polls. Next articleCould Trump be prosecuted over sexual assault accusations?